I know bees fly for many miles to collect nectar and pollen, but since they’ve entered our lives now, I’m hoping that I provide enough flowering plants for them to be happy closer to home. I wouldn’t insist they just forage in our garden but at least I can encourage them to do so by providing them with flowers they like. I’m not sure the bees are that particular, but I am providing them with wholly organic flowers to work. Fragrant flowers make up most of our garden. The runners-up are wild and native flowers. 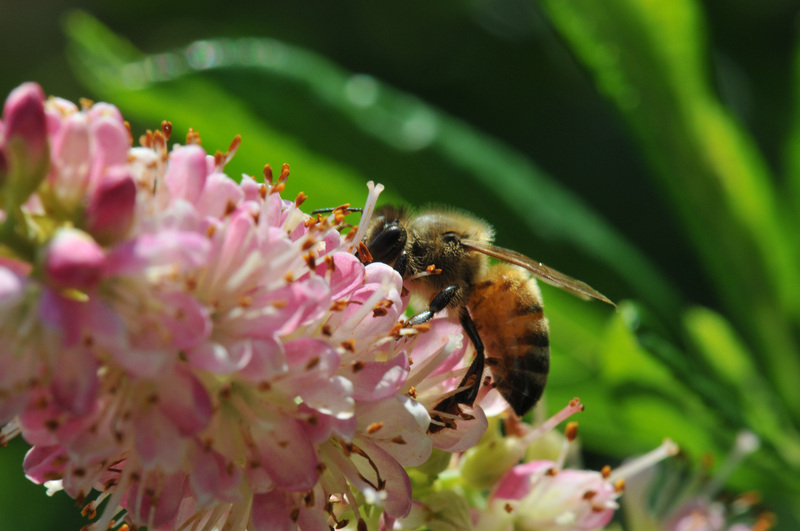 Since I started to keep bees, I have been searching for plants that will provide nectar and pollen for them. 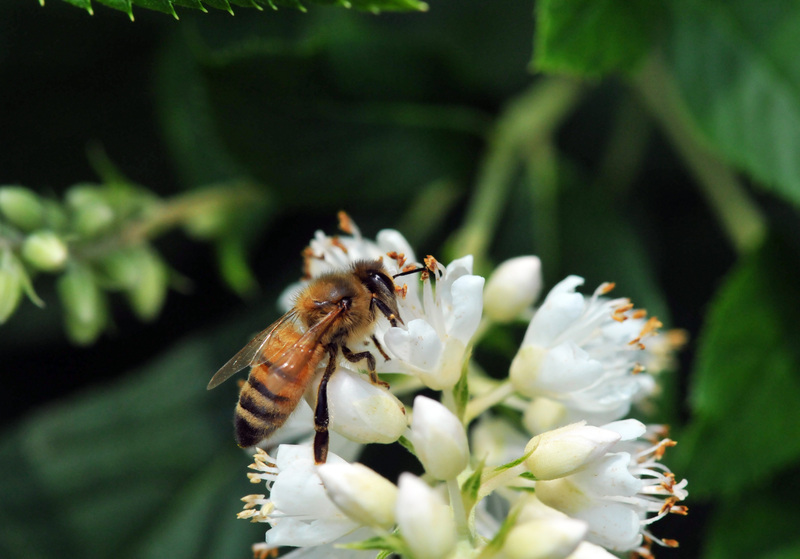 Surprisingly, a lot of plants and flowers we have in our garden already are suitable for bees. 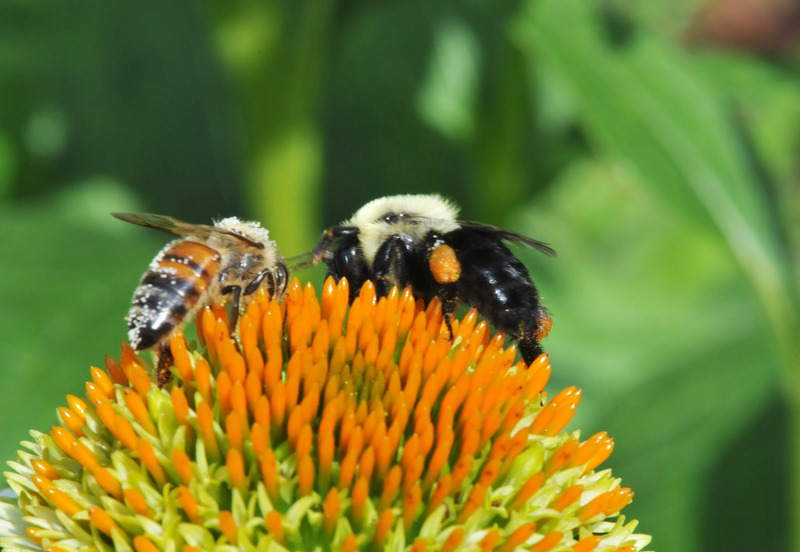 I should have known since we have a lot of Bumblebees, Carpenter bees, Sweat bees and other insects that thrive on nectar. 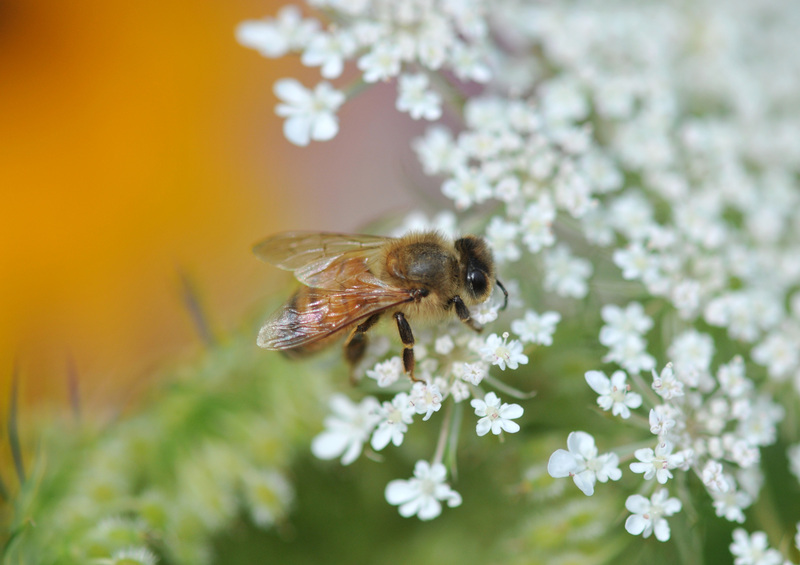 One of the blogs I’ve been following has posted Favorite English Garden Bee Plants – Candytuft (Iberis sempervirens) and provided a list of plants for bees from The Royal Horticultural Society which I find very helpful. I can’t place all plants on their list from across the pond in our garden but I’m going to do my best to add more. Another blogger and beekeeper on the other side of the Atlantic has also posted What’s flowering now: mid August 2012 regarding flowers for bees in late summer. In response to the last line on her blog, here’s what’s still blooming in the garden on this side of the Atlantic, despite the heat, thunder storms and hail. Our bees still have plenty to put in storage for the winter. Queen Anne’s lace (Daucus carota). It’s a beautiful weed. I let it grow every year for its beauty and for foragers. Summersweet (Clethra alnifolia) ‘Vanilla Spice’. This is a great summer flower, highly fragrant and a butterfly and bee magnet. Another Summersweet (Clethra alnifolia) ‘Ruby Spice’. 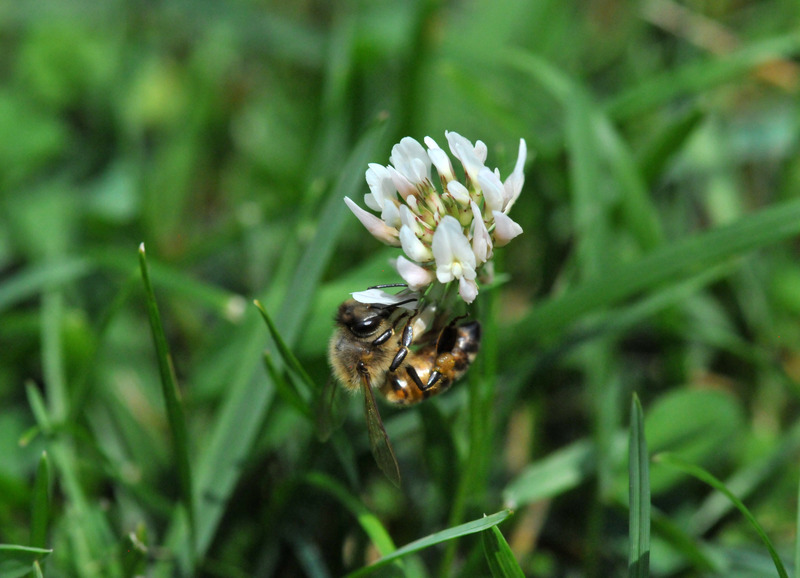 Hanging on to a White Clover, another weed. By any other name would smell as sweet? 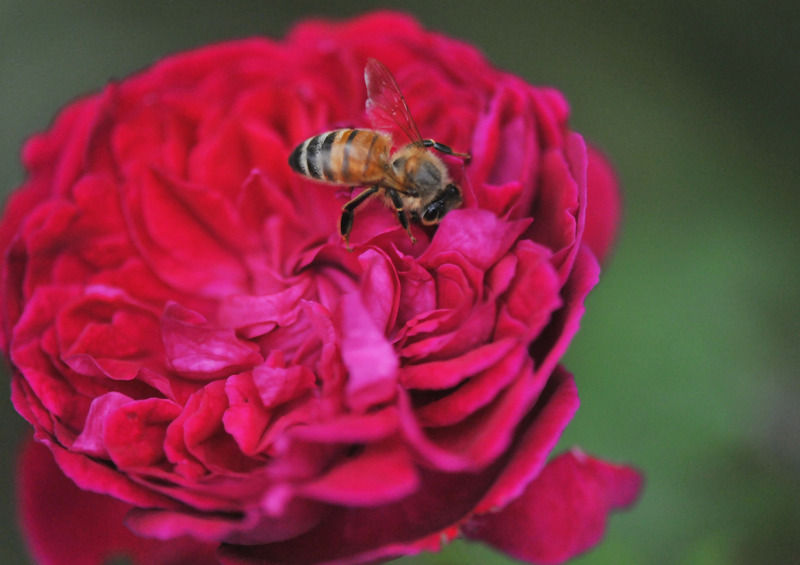 This bee seemed to agree with Shakespeare since she has been working on this William Shakespeare rose for a while. Highly fragrant and a re-bloomer. Butterfly Bush (Buddleia davidii), another butterfly and bee magnet. Highly fragrant, fast grower and very invasive if you let it set seed. But, it’s worth growing if you want to have butterflies in your garden. Echinacea ‘White Swan’, one of many Echinacea in the garden. Not exactly in focus but I didn’t want to miss a chance to capture their co-existance by stopping to set a shutter speed. Loved seeing which flowers your bees are visiting 🙂 We have white clover and buddleia here too. Thanks for linking to my post! We just try to keep these ‘Apis Italiane’ happy short of feeding them cannoli. bumble and other bee (nicely pollinated back side on that one) share! a talented watercolorist of gardens in general…he inspires me to paint. Looking forward to your next post. Simply Bee you tee full! The weather up here has not been cooperative for photography. The garden got beat up pretty bad by a recent rain storm. 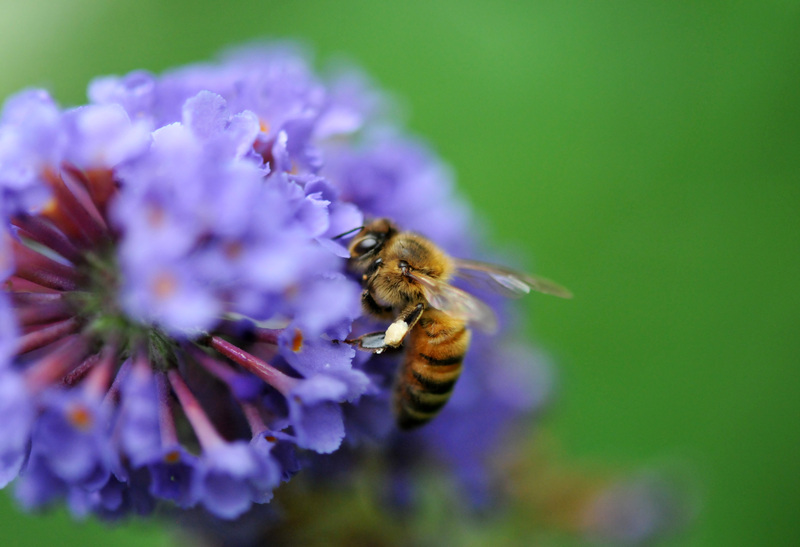 On a sunny day, the bees buzz around especially on the Summersweet, Butterfly Bushes and the Garden Phlox. Talking about Prince Charles, have you read his book “Harmony: A New Way to Look at the World”? It’s about re-connecting to nature and the value of the old ways of agriculture, pretty interesting. Your bees must be very happy in such a pretty, supportive setting as your garden. I’ve grown Candytuft (Iberis sempervirens) for a long time and can recommend it. I must look into Clethra–yours are lovely. I hope so. Happy bees will make good honey and won’t sting me. The Clethra is great once established and will perfume a garden all summer. It’s also a native plant here.